Baang + Burne Contemporary is proud to present Boys Don’t Cry, a three person show featuring the works of Joseph Cultice, Chris Jehly and Rich Tu. 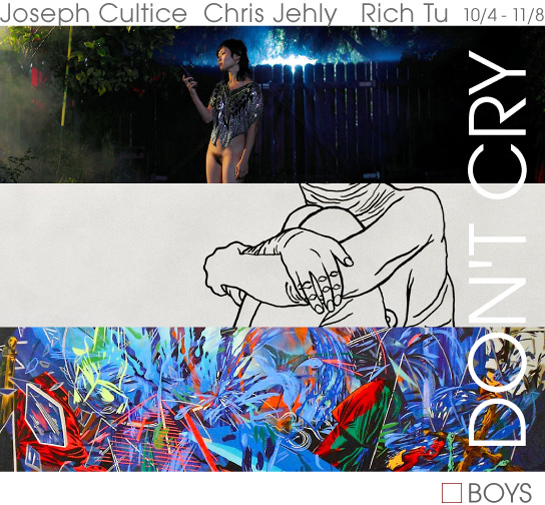 These three artists stemming from different disciplines, working in different mediums, come together in Boys Don’t Cry. Finding a pathway to express their desires, fears, and unanswerable questions poignantly through their work are what each artist has in common. By utilizing personal demons stuck within, each unfolds the inner workings of their psyche earnestly, explosively, sarcastically, violently and with hope. Rich Tu’s massive minimalist drawings are a new beast, a contradiction in itself. The simple drawings stand up and declare a singular message from an exceptionally large stage (some measuring up to 50×50"), with equal part wit and macabre innocence. From the series There Will Be No Survivors, the viewers are confronted with a dark humor sliver lined with a toy solider delight. Irony is easy to deliver. To discover substance and vulnerability beneath repartee is a rarer find. Contrary to the trending aesthetic of contemporary art, which is often filled with saturated colors, bling, shine and excessive glamour, Rich’s work strips away the "pop" sensibility and offers up an elegant, black and white, naked, quiet scream.